The monolithic volume that rests on the site represents the people of the cause for social justice and civil rights, constantly surrounded by external pressure from society. A subterranean element organized with a procession of "depiction galleries" is seen rising, wrapping, cutting, and fracturing the form, creating a powerful contrast between the two major programs: depiction and activism. The overall composition of the Liberty Museum represents a holistic group of people bruised and fractured by violence and injustice, but through strength and perseverance can remain standing through devastating hardship. The Fracture becomes a reminder of the scars left behind by tyranny and oppression, but the voids are cloaked in light and transparency to symbolize healed wounds of a determined group of activists, constantly engaging in The Fight. Depressing the existing ground plane creates opportunities for new and exciting public space and is instrumental in reducing total building/lot coverage. An open-air theater, landscaped zones, and various types of gathering spaces are choreographed along the procession to the museum's main entrance. Interior exhibits for depiction follow a series of corridors that ramp up past the existing ground plane around the south and west facades. 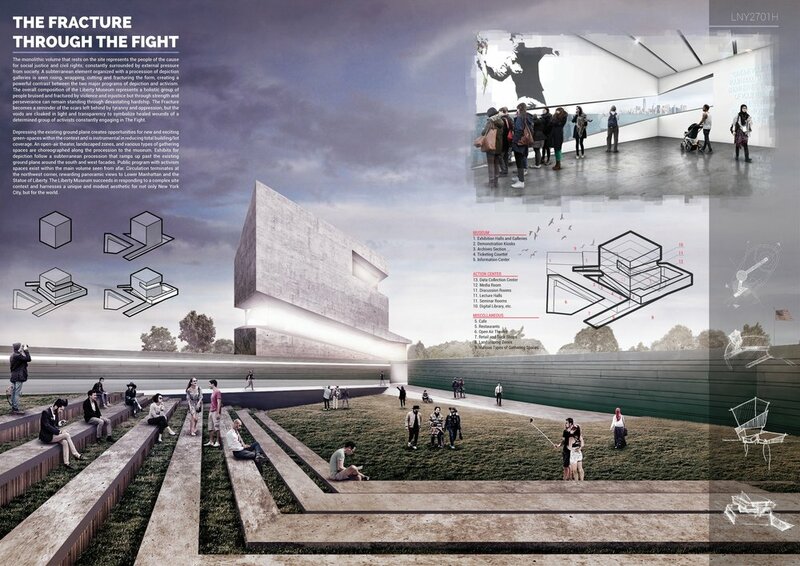 Public program with activism spaces exist within the exposed concrete volume seen from afar. Circulation terminates at the northwest corner, rewarding panoramic views to Lower Manhattan and the Statue of Liberty. The Liberty Museum succeeds in responding to complex site forces, while expressing a unique and modest aesthetic for New York City and its international audience.